Willia Winnie Momberere’s new book, Torn Between Two Lovers, ($18.99, paperback, 9781498467582; $9.99, e-book, 9781498467599) is an absorbing read that follows Zimbabwe native Ruben and his cast of friends as he grows into adulthood and adjusts to a challenging new life in America – and the freedoms that come with it. Throughout this exciting narrative, readers learn of the characters’ thoughts on family, addiction, and confidence in the Lord. Witness the powerful transformations of colorful characters that have endured the worst forms of abuse and turn to God for healing. Plot twists and suspense keep the reader turning page after page to find out what happens next. This powerful story will encourage the youth to make better choices and turn to God in times of trouble. Willia Winnie Momberere is an Evangelist and a master storyteller who writes stories for the glory of God. She considers herself a voice of the voiceless, the oppressed and the abused. Willa captures African cultural traits and includes them in her highly visual and entertaining writing style. She shares many stereotypes and little-known facts, cleverly interweaving them into the readers’ psyche. She touches on relatable themes, bringing the challenges of all characters to light. Her knowledge of the Bible, and stories of faith in her book keeps God central throughout each chapter. She reminds readers that He is always available to lean on – always allowing His glory to manifest. Xulon Press, a division of Salem Media Group, is the world’s largest Christian self-publisher, with more than 15,000 titles published to date. 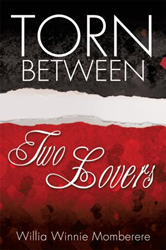 Retailers may order Torn Between Two Lovers through Ingram Book Company and/or Spring Arbor Book Distributors. The book is available online through xulonpress.com/bookstore, amazon.com, and barnesandnoble.com.